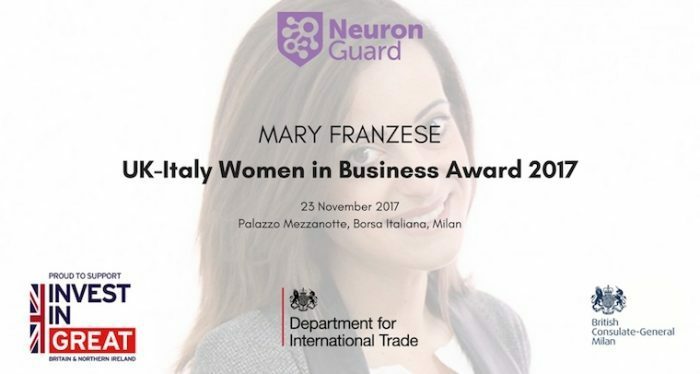 Milan, 23 November 2017 – We are honored to announce that our cofounder Mary Franzese has received the “UK-Italy Women in Business Award 2017” for her commitment in women entrepreneurship together with the great scientific and technology value that Neuron Guard will bring to the British economy. Borsa Italiana and the Department for International Trade presents UK-Italy Business Awards 2017. The Awards recognizes the Italian excellence in culture and technology innovation that have chosen the UK as a key market for their future international development, bringing high quality investment to the British economy, renowned for its openness to business. Our cofounder received the award by Ms Jill Morris CMG, Her Majesty’s Ambassador to the Italian Republic and Her Majesty’s non-resident Ambassador to the Republic of San Marino, and Tim Flear MVO, British Consul General and Director of Department for International Trade (DIT) Italy. She had also the chance to present Neuron Guard and her involvement in the female entrepreneurship community. We are pleased about the interest they have showed in what we are doing with the United Kingdom, in particular with the Brian Injury Healthcare Technology Cooperative, University of Cambridge, Cambridge University Hospital and TWI. “I am very honored to receive the UK-Italy Women in Business Award. This acknowledgement represents the perfect depict of the outstanding work we are doing in Great Britain in transforming our prototype in the next standard of care for the early and on-site care of brain injury” Mary told after receiving the Prize. A very warm thank you to the Department for International Trade and the British Consulate-General in Milan for making this possible.